The morning was sultry with some patches of cumulus. The cumulus basically persisted throughout the day. Altostratus and cirrostratus could barely be observed through the cumulus and the moisture haze. This definitely indicated an unstable environment and, even though I was attending school that day, my attention focused more on the weather than on the school work (as usual!!). The sky spelled out a scene of afternoon thunderstorm development. Between 3:00 and 4:00pm, thunderstorms and showers did develop but mainly to the north and northwest and not that spectacular. Brief rain occurred at Schofields just enough to wet me as I made my way from the bus to the house, and then it stopped. These thunderstorms either dissipated or disappeared to the north amongst the moisture haze and cumulus. I began to look towards the west and south west for any signs of thunderstorms. Then the storms appeared. By this time, the patchy cumulus had increased significantly. Just visible behind a clearing of the cumulus, a line of massive cumulonimbus facing northwest to southeast was bearing down on the Sydney region. As part of my normal routine, I turned on the radio to hear the Mike Bailey updates of the weather at 5:15pm and he prompted warnings of a line of severe thunderstorms that had produced very heavy rain at Campbelltown and some minor flooding. At this stage, my adrenaline began to flow. As the bases of the storm obscured the cloud tops, it became apparent that this was no ordinary thunderstorm. The more it approached, the more severe it looked. Apart from the darkness, several layers of lower stratocumulus clouds began to approach from the south and southwest including scuds. In the precipitation cascade, I observed a light greenish tinge which indicated that hail was most probable. The lightning was flashing at an increasingly rapid rate leading to rolling thunder. The storm struck with a severe squall of SW winds and almost immediately there was a blackout. (The clock stopped at 5:45pm; the time of the blackout). The rain followed soon after and increased to a torrential downpour. The wind was so strong that the rain was almost horizontal. Rain that normally drained off the garage corrugated iron roof was blown away with the wind. The roll-a-door rattled violently due to several extreme wind gusts. Outside, the lightning was flashing continuously and there was a weird pinkish colouring all around. The visibility was virtually a matter of a few metres. The wind had turned southerly by this time which, as will be discussed later, was at the height of the storm. There were some pea-sized hailstones heard hitting the roll-a-door but they only lasted less than a minute. Outside, the drains could scarcely cope with the immense volumn of water. The wind had now turned to a southeast and easterly and began to abate. The rainfall by now had also decreased to moderate rain. Outside, neighbours came out as if it were a planned meeting. Everyone seemed shocked or dazed. They began talking about the damage: trees uprooted, powerlines down and houses unroofed. 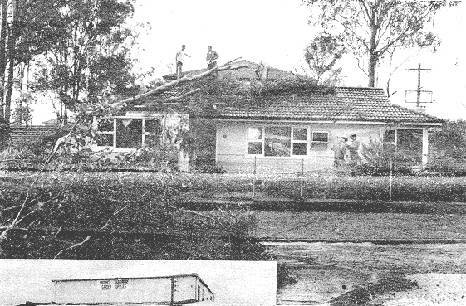 But because rural Schofields has a relatively low density of housing and trees, it was not until you travelled into the residential parts of Schofields and Riverstone that the full horror became apparent. Trees were down in so many places that some roads were impassable. The power lines were cut in so many places either from falling trees or from the high frequency of the lightning strikes. Riverstone in particular was without power for 2 days following the storm. 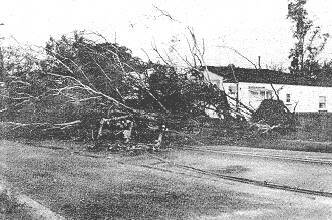 Trees had fallen onto the railway cutting the wires and making the railway line live. 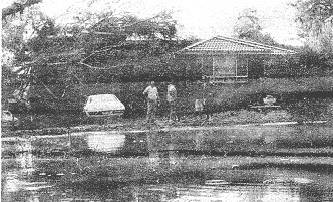 Almost every dwelling had suffered some form of damage; most of the damage occurring from trees falling onto houses. I observed a 2 story factory unit in Riverstone with the one whole brick wall blown inwards. The damage reports from the storm are endless. Insurance claims from the two small townships amounted to around a half a million dollars. The most amazing part was that only a few people were injured and nobody was killed. There were several stories of lucky escapes. One person driving in the main street of Riverstone at the height of the storm was almost crushed by a falling tree. The tree brought down a telegraph pole: the power lines bouncing onto his car. Another person who had driven through the storm suggested that the winds made it impossible to steer the car and it swung from left to right. Others reported that their cars were almost lifted from the ground. Another significant feature of the storm was the flash flooding. In fact, one of the creeks in Schofields flooded to the one in a hundred year flooding level. The local swimming pool in Riverstone apparently filled and overflowed from the amount of run off. I am unsure of the amount of rainfall during the storm. One unconfirmed report suggests that around 25mm fell in 20 minutes. Although this represents a substantially high rainfall rate for this region, I believe that the intensity of the rainfall judged from the lack of visibility and the flash flooding indicates a much higher rainfall rate than any other storm I have observed in this region. And, of course, you may be wondering why tornadoes have not been mentioned. Well, I had no idea until recently whilst searching through the compiled severe weather database of the Bureau of Meteorology that a tornado had occurred. Another report backed up by the Bureau suggests that a tornado also touched down at Wisemans Ferry probably from the same storm. A person reported a sound like an approaching freight train. If this is the case, a single tornado may have tracked over 25km from Riverstone to Wisemans Ferry or there may have been two separate tornado touch downs. A feature that provides evidence of a possible tornado is the change in the wind direction during the storm. Beginning from the southwest, it swung to the south, southeast and then gradually to the northeast. Further, we had a light fitting on each corner of the house. Those exposed to the most intense wind gusts from the southwest to the southeast were blown away. 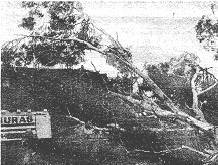 Another crucial piece of evidence was that the direction trees had been felled was mostly northerly. 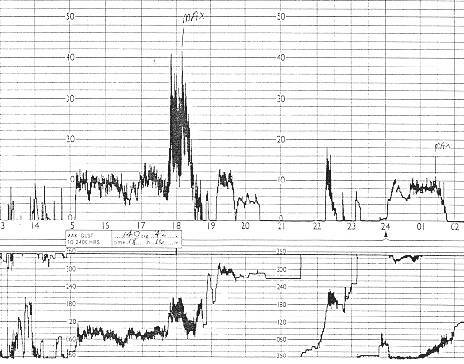 It would have been interesting to have seen an aerial view of the damage to see if there was evidence of convergence. Certainly the damage as shown on the photos indicate severity. The Bureau of Meteorology�s evaluation of the event is that a tornado did occur. In the days previous to the day of the storm, the insects were prevalent and the black ants were building unusually high mounds above their nests. And, as is to be expected in February, the humidity was high and the temperatures in the mid-30s.